I mean, if you're excited because you see what an amazing company this is… surely everyone else will see it too, right? It reminds me of something that happened to my sister a few years ago. One warm, sunny Saturday afternoon as my she was doing some house cleaning…. she heard a loud rumbling down the street…. as it got closer, she could hear it slow down. She was thinking, “Whoever is driving that thing is obviously proud”! It then sounded like it was coming onto her driveway, she heard several “VROOM VROOM'S” before everything went quiet. … And wouldn't you know it. Her husband bought a brand new Harely Davidson Motorcyle. She didn't even know he LIKED motorcycles. What had happened, her husband was driving in town when he happened to pass by the local Harley Davidson dealership. He couldn't help but notice the smiles on everyone's faces and the look of joy on those who were riding their own bikes as they were coming and going. They were having a big blitz that included some fun giveaways and great deals. He decided to pull in and “check it out”. He was surrounded by other people who talked about how awesome it was. How they felt so free. How they felt empowered to handle such an amazing piece of machinery, to be outside and a part of nature. Many of the men's wives were there also exclaiming how much they loved riding with their husbands and feeling the wind in their hair. Before too long, he was sucked into the glamour of it all… and it he did it. He bought a Harley Davidson motorcycle. Meanwhile, can you imagine the look on my sister's face? Do you think she felt the same way he did when he pulled up with that motorcycle? She has never ridden on the back of a motorcycle before and never thought about what it would be like to do so. HE was emotionally attached. She wasn't. I'm sure you can imagine the confusion she felt…..
Well…. the same thing kinda happens in the home business direct sales & network marketing space. While we're still excited, we're told to contact all our friends and family to tell them about this amazing new “Harley Davidson Motorcycle” we just bought and we expect them to be just as excited as we are, right? Listen. 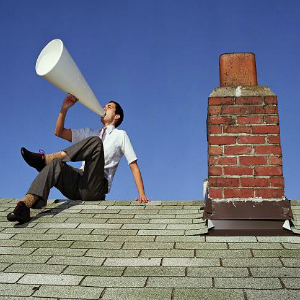 Whatever product or business we are in, it's not about standing on the rooftops and shouting it to the world. It's about finding people that are looking for what we have. I mean, YES, we SHOULD contact all our friends and family and tell them about our new business venture…. but telling them over and over and over and over and over again isn't the most effective way. What if you started doing things just a little bit differently. Instead of announcing to the world about your business and all the amazing specials they're having at the moment…. …What if you actually started sharing information that would not only cause your current friend & family to raise their hands, but new people you've never even met before? Okay, Michelle… What's the secret? 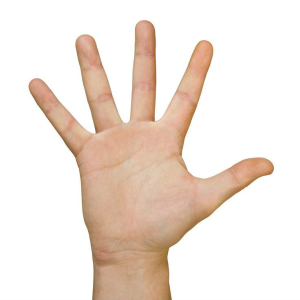 How can I get people to “raise their hands”? Let's say you're in a company that sells weight loss shakes. Which post do you think is more “Attractive”? One of those 3 tips just so happen may be a recommendation to look at your awesome weight loss shake. (wink). Attraction Marketing is where you are attracting prospects and customers to you by creating content that adds value, provides solutions, and solves the problems of your target market. Or what i like to call education-based marketing… it’s the best way to establish you as an authority and truly allows you to dominate any niche… and i’m going to show you how. Because you can outsell anybody if you simply start teaching. The big benefit to Attraction Marketing is it attracts customers to you, versus you constantly having to go out, pitch, chase and cold call. Did you know on the average, only 2-3% of people are ready to buy NOW? Most people are marketing to that 2-3 percent. Most people are going to seek information before they make a buying decision. So if you can begin in your marketing, leading with value and educating people in your target market… you're going to be WAY AHEAD. Let’s say you're business is in the weight loss niche. I’m interested in losing weight and toning up…. but i’m not ready to buy… and let’s say I’m seeing someone on my newsfeed and they are educating me. Why missing zzzzz’s can make you fat? I would be a lot more apt to follow them and buy from them… than someone who is constantly selling and pitching on social media to buy buy buy. Because you are not only educating them, but YOU are going to be perceived as more valuable and you’re going to start attracting your ideal prospects. Attraction marketing doesn’t have to be difficult. Following these 5 simple steps will have people chasing you for more information instead of you doing the chasing. Everyone has a personal brand. It is the way people describe you when talking with others. Branding yourself is all about letting your personality shine to show what sets you apart from everyone else in the online world. 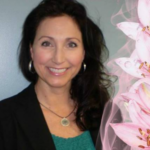 Use the traits you are most known for to become the authority figure in your industry or niche. Successfully creating a personal brand will make you a trusted advisor because you are offering the information and training your prospects to need. You will be sought after when they are looking for a solution if you start answering their questions before they even know they have a question. Offering value can be done a lot of different ways. Common ways to offer value include providing inspiration, skill-based training, and answering questions to help solve problems. There are several common ways to deliver value to your potential customers. One of the most common methods of providing value can be seen on social media daily. Social media is busy…. SUPER BUSY…. which means you need to not only stand out, but you need to be different. Blogging is another common method used to deliver value. I mean, that's what you're reading right now… is a blog post! Plus, I can arrange all my posts according to what topic I'm talking about which is really cool. It's essentially my “home”… my “own personal hub” that enables you to learn valuable content, more about me, and hopefully become a subscriber. Unlike social media, a blog is visible to search engines. A blog post can continue to bring traffic to your website years after the post was written. For more information about ways, blogging can help your home business, click here. Video is the #1 hottest way to get people to know, like and trust you. There is no faster way to connect with your audience than video. Online marketers are always building their “List”. The email list is the best way to build a long-lasting relationship with your audience. This is an audience that has raised their hand and asked you to send them information and updates that can be helpful to them. The information you give can take many different forms such as a checklist, eBook, tool, video, etc. and in all cases helps to solve a problem your audience is experiencing. This contact information is often collected on a capture page similar to this image on the left. There is a promise of valuable information that will be received once the form is filled out and the “Give Me My Checklist!” button is clicked. The next page will either deliver the information promised or provide instructions on how it will be received. The contact information is automatically added to an autoresponder program which can be used for future email communications with your audience. There are a number of autoresponder programs available. The program I chose is Aweber because of its ease to use and full functionality. Collecting contact information can also be done manually by messaging people on social media or talking with them in person. Once the contact information is collected, deliver the goods through an email account. It is possible to complete Step #3 manually but it does limit the number of people you can impact without automation. I mean, can you imagine waking up to people who have asked for more information…and you were able to deliver that even while you're sleeping? 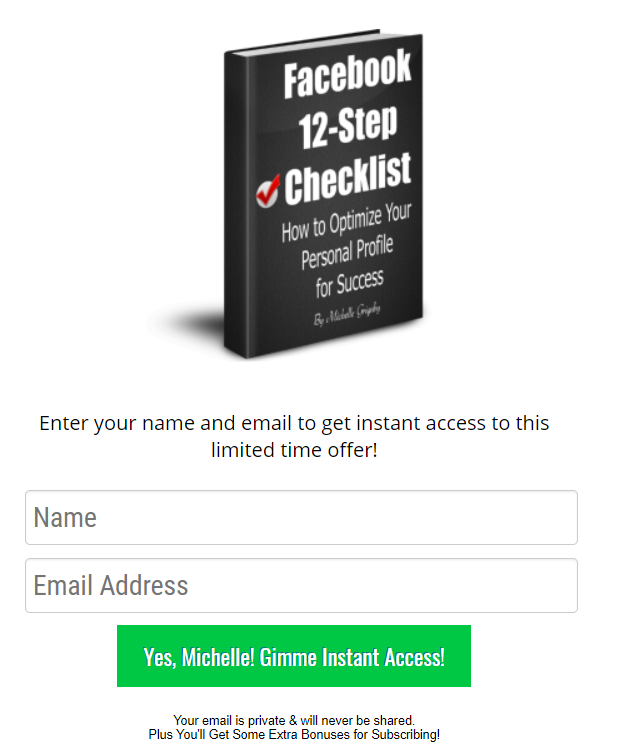 Here's an example of my most popular Giveaway that is highly valuable, ESPECIALLY if you want to make sure your personal Facebook Profile is set up correctly. 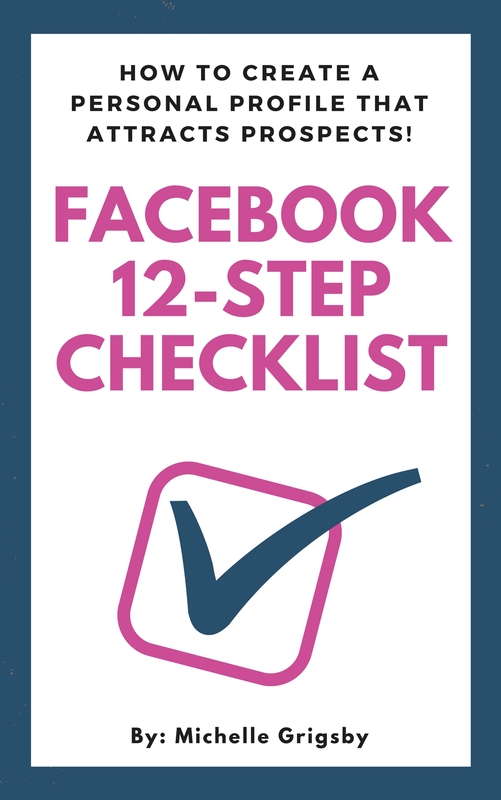 CLICK HERE to grab my 12-step checklist. If a phone number was left in Step #3, it is important to connect with that person. There are a lot of automation tools available on the market but nothing works as well as picking up the phone and having a conversation. It is best to make that connection within the first 48 hours of them leaving their contact information. This conversation can take many different directions which we will dive into in a later post. To get started, a simple call to introduce yourself and make sure they received their training. To determine the need for your prospect is a simple conversation. There is no magic script to move this contact to a sale. If you didn't capture their phone number, you can always invite them to connect with you by replying to your email or messaging you. The KEY is…. have a simple conversation to determine what is going on in their business and where you may be able to help. This conversation should be a lot of listening as they answer questions you pose to understand their business and what needs they have. It is truly amazing how attraction marketing can turn your home business around. When people are coming to you instead of you chasing after them, the whole dynamics of your business starts to change. It will not happen overnight. When it happens, you will enjoy all the people that you can help achieve the dream of their business. P.S. 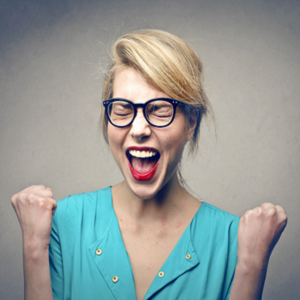 Anyone in sales will love this awesome new tool! Plus get highly effective online training for more leads. Click Here to learn more!